Non-representational wallpaper was a major trend in the 1950s. A large portion of consumers were looking to distance themselves from the overly-fussy, representational wallpapers of the pre-war era, and instead looked to geometry, modernist design and abstract art for inspiration. Because of newly available low-cost screen printing methods, wallpaper manufactures were able to introduce a plethora of these new ‘modern’ papers to the market. This paper, called ‘Doodles,’ was produced ca. 1950-52, and features zig zag lines, crosshatching, circles and exes overlapping in seemingly random order across the page. 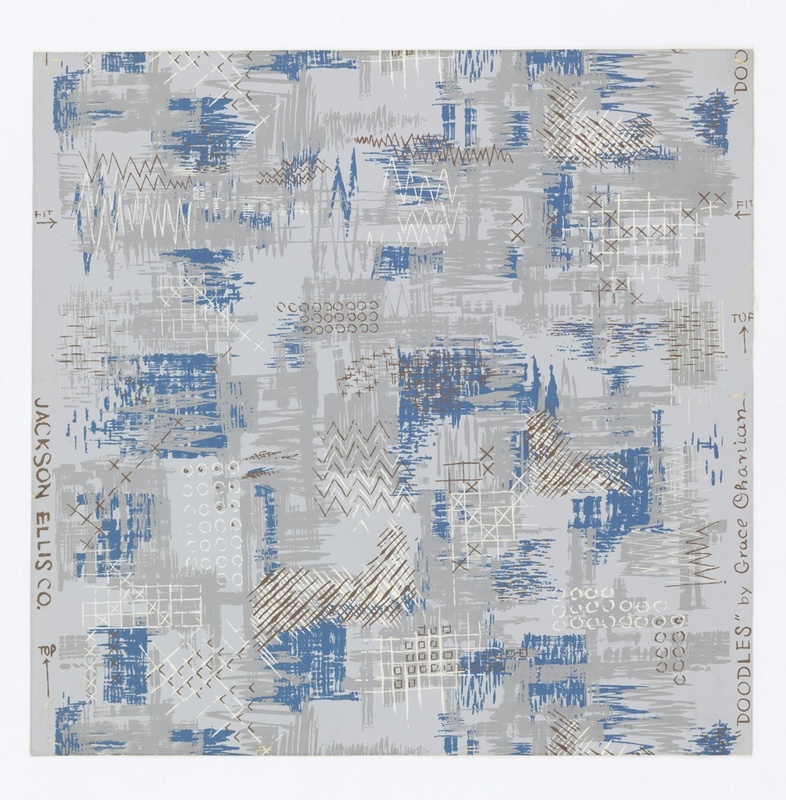 The marks are strong and hurried, like the jagged lines on a Richter scale readout, but the muted grays, browns, whites and blues give the design a calming appearance. This paper was designed by Grace Ohanian, a graduate of Cooper Union and a lead designer at Jackson Ellis Co., where this wallpaper was produced. The company was known for making hand-screened wallpapers and coordinating fabrics. By 1959 Jackson Ellis Co. had made such a name for themselves that they were purchased by Gino Scalamandré, the famous supplier of decorative furnishings and wallcoverings. Scalamandré had founded his eponymous company in 1929, and would later be involved with the Kennedy administration’s 1969 redecoration of the White House. Once he took over Jackson Ellis Co., their papers and fabrics were sold directly to the trade as the “Jackson Ellis Collection.” Scalamandré did not just purchase their name and rights to previously published works, however, and Ms. Ohanian and Mr. Ellis continued to do their own designing under his umbrella. Sidewall, Doodles, 1950–52. Designed by Grace Ohanian. Screen-printed on paper. Gift of Grace Ohanian. 1952-33-1.